Rep. Beto O’Rourke is still trailing incumbent Ted Cruz for the state’s Senate seat. Rep. Beto O’Rourke might only have a long shot at flipping one of Texas’s US Senate seats blue, but he is making gains among one group that generally votes Republican: Texas independents. But Texas independents have broken with their usual political allegiances in a surprising way. Republicans in Texas generally rely on independents and moderate Democrats to maintain their significant hold over state politics. In the Senate race, however, independent voters prefer O’Rourke to Cruz by 12 points, which suggests the grassroots enthusiasm that has rallied local progressives around O’Rourke may be spreading beyond the Democratic base. Respondents in the Tribune and University of Texas survey were asked about their electoral preferences from Oct. 15 to Oct. 21 — before President Donald Trump visited the state to rally support for Cruz. 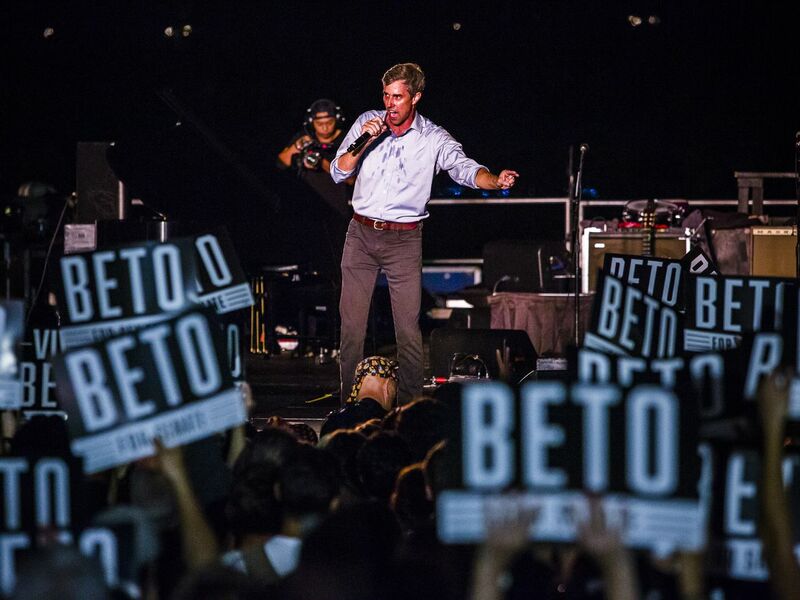 At a campaign event in Houston on Monday night, the president tore into O’Rourke, branding him a “stone-cold phony” and an “open-borders left winger.” O’Rourke has made an unusually strong showing in a state that Trump won by nine points in 2016, campaigning on subjects normally taboo to red state Democrats like immigration and gun reform. The last time Texas had an election for the Senate, in 2014, incumbent Republican Sen. John Cornyn beat his Democratic rival by nearly 30 points, which may be why Republican strategists are nervous about how tight the current race is sitting. Texas independents’ preference for O’Rourke is another worrying sign for the GOP at a time when Democrats across the country appear poised to outperform their traditionally weak midterm showings. For other statewide offices that the University of Texas poll asked about, like the governor and attorney general races, the Republican candidate is favored among independents. Independents break for Republicans in those races by double digits, and when asked whether they would support a generic Republican or Democrat for Congress, independents choose the former by 10 points. In order for Democrats to capture the Senate in November, they will have to hold onto nearly all of the 10 Democratic seats currently up for reelection in states Donald Trump won in 2016. Should they clear this uncertain hurdle, Democrats would need to flip two additional seats currently held by Republicans. The polls don’t indicate that O’Rourke will be the one to do so. But even if he can’t pull off an upset victory, his unusually high enthusiasm among Democratic voters during this cycle may help drag down-ballot Democrats across the finish line in competitive races. O’Rourke’s campaign raised more than $38 million during the third quarter of this year, setting the all-time quarterly fundraising record for a Senate candidate. The campaign said that was a product of 800,000 small donations, reflecting the outsize attention and enthusiasm surrounding his bid. Whether that — and the support of Texas independents — will be enough to turn the Senate seat blue, is another matter.